A shield belonging to the Holy Kingdom of Akaneia. Nyna, the Princess of Akaneia, entrusted the Emblem to Marth in their battle against the Dolunian Empire. In the remake, Marth obtains it physically as an item and it allows him to open treasure chests like in Mystery of the Emblem. Contrary to popular belief, the Fire Emblem is not required to wield the divine Falchion sword. There is no mention about it being required in the game’s story, and Anri (the original wielder), as well as Marth’s father, Cornelius, were able to wield the Falchion without it. It does not feature. However the game’s continent exists in the same world as the previous game. The same object as in Dark Dragon and Sword of Light. In Book 1, Marth can obtain the Emblem physically as an item and, gameplay-wise, it enables him to open treasure chests. In Book 2, Marth discovers that the Fire Emblem is actually part of the Shield of Seals, an mystical item created by the Divine Dragon King to seal away the evil Earth Dragons. By combining the Fire Emblem with the the five sacred spheres, Marth can restore the Shield of Seals to its original form. Its function in-game is to repel the Earth Dragons summoned by Mediuth. In New Mystery of the Emblem, the Shield of Seals also boosts all of Marth’s stats by 2. It does not physically feature. However it is briefly mentioned in the Epilogue, by the successor of the Velthomer family as the family’s crest (although it is called Honoo no Monshou, instead of its usual Faiā Emuburemu). It is described as a “mark of justice” and, after the crimes committed by the Velthomer, the successor wishes it can be called that name again in the future. Like in Gaiden, it does not feature. This time, the game’s continent is the same as in the previous game. Bern’s national treasure, a gem that is kept within the Shrine of Seals. When King Zephiel started to invade the other nations of Elibe, his sister Guinevere stole the Fire Emblem from the Shrine of Seals in hope of stopping him. The Fire Emblem is the key to unlocking the Sword of Seals, a powerful and spiritual sword, once used by Hartmut of the Eight Legends, which can defeat even the most powerful of dragons. Guinevere entrusts the Fire Emblem to Roy, and he later obtains the Sword of Seals using it. In the Hasha no Tsurugi manga, a sidestory of sorts to the Sword of Seals storyline, the Fire Emblem also has a major role. During the first battle with Zephiel, Al picks up the Fire Emblem after Guinevere dropped it. The seal on the Fire Emblem breaks and its power awakens Al’s inner strength, transforming him into a Dragon Lord. The same object as in Sword of Seals—once again Bern’s national treasure. This time, its primarily role is as a ceremonial object for the coming-of-age ceremony of Bern’s royal heir. However it is stolen from the palace vault by the Black Fang. Without it the ceremony cannot begin and Prince Zephiel cannot be recognised as the heir to the throne. Eliwood, Hector and Lyn volunteer to recover the Fire Emblem for Zephiel’s mother, Queen Hellene, in return for the location of Bern’s Shrine of Seals. One of the Sacred Stones, belonging to the Grado Empire. Trapped within it is the fiery soul of the Demon King of legends. 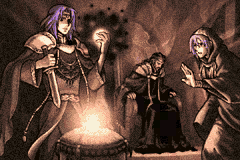 Prince Lyon and his mages researched the Fire Emblem hoping to use its energies to aid people. After Emperor Vigarde died, Lyon split the Fire Emblem into two—one half the Sacred Stone and the other half the Dark Stone, which contained the pure magic of the Fire Emblem. After the Dark Stone’s creation, Lyon destroys the Fire Emblem. 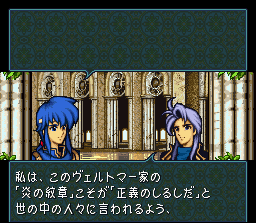 The Dark Stone then corrupted Lyon, which led to Grado attacking the other Sacred Stone territories. A bronze medallion, which once belonged to Lehran of the Heron clan. 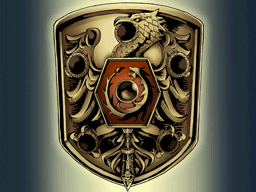 It is usually referred to as Lehran’s medallion instead of the Fire Emblem. The medallion is said to contain the trapped spirit of a chaotic and dark god, which causes it to glow an azure colour. If a person, who doesn’t have enough Order, touches the medallion physically, they lose control of their very selves and enter a berserked rage. 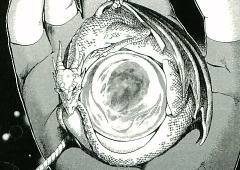 The medallion is hunted by Daein’s King Ashnard, who wishes to awaken the dark god to reshape the world to his likings. The same object as in Path of Radiance. 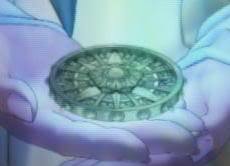 However it is discovered that the being sealed within the medallion is Yune—the Goddess of Chaos and Ashera’s other half. Long ago the creator Goddess, Ashunera, discarded her emotions, which manifested into Yune, and became Ashera. Yune agreed to be sealed within a medallion held by the Heron, Lehran, after her rebellion against Ashera ended with her defeat by the Three Heroes. As the war between Begnion and the Laguz Alliance reaches its peak, Micaiah sings the galldr of release to free Yune from the medallion.